Boca Raton, FL, May 07, 2012 / -- Office Depot, Inc. , a leading global provider of office supplies and services that helps customers save time, hosted six students from Howard University�s John H. Johnson School of Communications at the Company�s corporate headquarters in Boca Raton, Fla., as part of the school�s Adopt-A-Team Professional Development Program. The program is designed to provide experiential preparation for sophomore and junior level students studying communications for successful entry into the workforce upon graduation. The students, who are majoring in public relations, advertising, journalism, production and marketing, toured the corporate campus and met with Office Depot executives and associates in their respective areas of concentration who answered questions and provided insight on their industries. In addition, Robyn Tyler, Vice President of Global Talent Management for Office Depot, provided resume and interview advice, while Michael Allison, Executive Vice President of Human Resources, spoke about what corporations are looking for in a job candidate today and how to succeed once hired. The public relations and advertising students put their studies to the test, writing press releases and creating marketing plans that were then presented to and critiqued by Office Depot professionals. �Office Depot really changed my perception about production's place within a corporate setting,� said Marcia Jennings. �I only knew about the retail part of the Company, but after my visit I became aware of how my major, Audio Production, is incorporated into the overall scheme of the business." Later in the school year, the students will plan and host an �Office Depot Branding Day� on Howard�s campus to promote the Company as a potential employer and an office supply source. 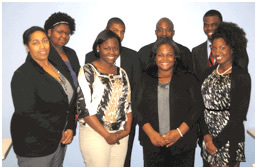 Office Depot also sponsors Howard University�s Communications Entrepreneurship Research and Resource Center (CERRC), which holds an annual business plan competition geared toward preparing students to become entrepreneurs. Office Depot, dedicated to helping customers save time and money, provides office supplies and services through 1,677 worldwide retail stores, a dedicated sales force, top-rated catalogs and global e-commerce operations. Office Depot has annual sales of approximately $11.5 billion, and employs about 39,000 associates in 60 countries around the world. Office Depot�s common stock is listed on the New York Stock Exchange under the symbol ODP. Additional press information can be found at: http://mediarelations.officedepot.com and http://socialpress.officedepot.com/.